What animal poo is this? Why would anyone want to look at animal poo? Sometimes wildlife is hard to spot, especially if it's nocturnal. But the signs that animals frequent an area can be a good start to discovering all kinds of species, from rare otters to common rabbits. In fact, ecologists rely on animal signs to help them understand the numbers, behaviours and movements of species. Such animal signs include calls, burrows, tracks, leftover meals, territorial markings, fur and droppings. So, poo can be very useful indeed! What do I do if I come across animal poo? You might encounter animal poo when you are at home, either in your garden or your outhouses, or when you’re out in the countryside. To identify it, take a note of the size, shape and colour, and break it apart with a stick to see what’s inside. But never touch it – it can contain harmful bacteria! Whose poo can I spot? Here are some common British mammal droppings you might come across, as well as some tips of what to look (or smell!) for. You can click on the images to view them in more detail. Droppings are left in clusters of little, round, hard balls. They are usually yellowy-brown or green in colour, and full of grass. 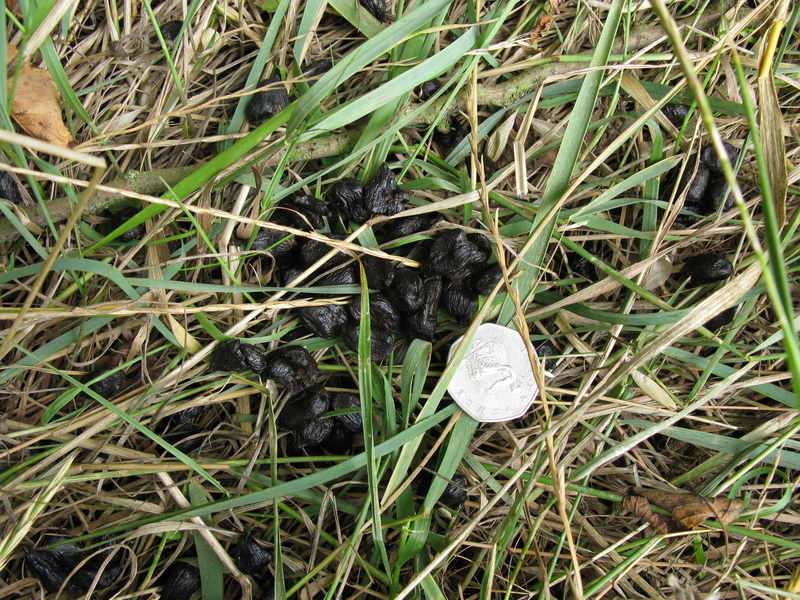 Hare droppings (on the right) tend to be slightly bigger and flatter than rabbit droppings (left hand side). Foxes produce dog-like droppings that are usually pointy at one end and full of fur, feathers, tiny bones, seeds and berries. In rural areas, fox poo is quite dark, but in urban areas, where foxes eat human food waste, it can be lighter. Fresh droppings have a distinctively musky or ‘foxy’ smell. 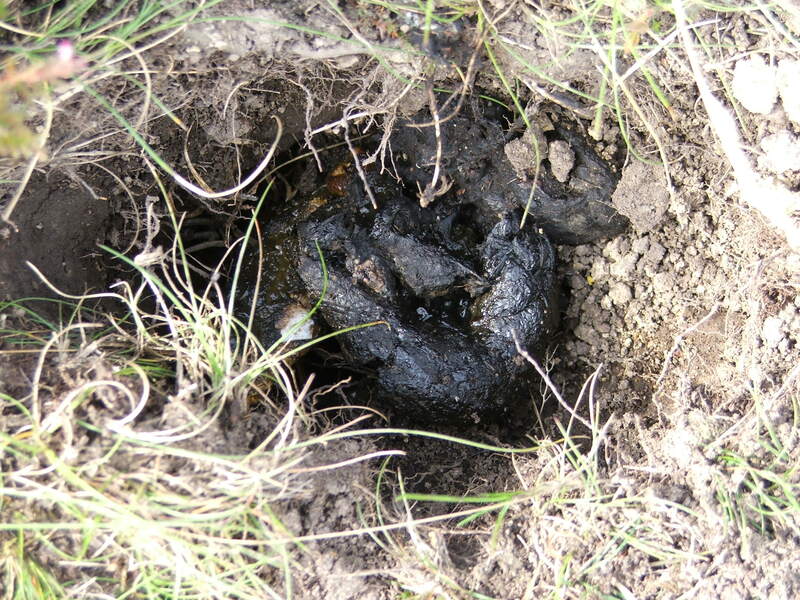 Badgers poo in shallow pits called ‘latrines’. Their droppings vary from firm and sausage-shaped, to softer, slimier and darker if they’ve been eating lots of worms! Badger droppings have a sweet, musky smell. Because deer ruminate (regurgitate and chew their food twice before digesting it), there are no obvious contents in their droppings. They produce smooth, shiny, dark pellets that are pointy at one end and often stuck together in clusters. Both these mammals are found in similar wetland habitats. Otters produce droppings known as ‘spraints’, which are left in prominent places along riverbanks, on rocks or under bridges to mark out their territories. 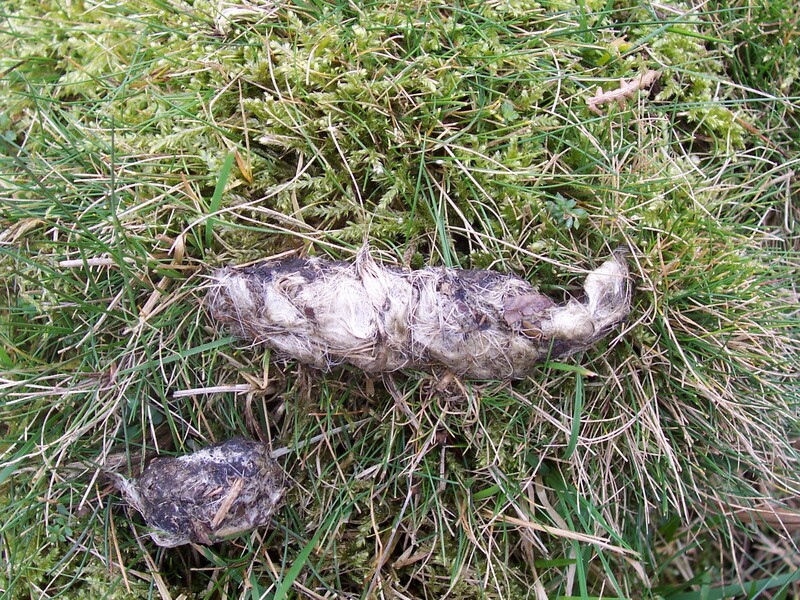 Otter spraints are usually dark greenish, slimy and full of fish bones, scales and crayfish parts. The ‘scats’ of American mink are smaller, black and contain fur, feathers and bones. Fresh otter poo smells like jasmine tea, while mink poo has a much less pleasant odour. Though they inhabit similar wetland habitats, the droppings of water voles and rats have several key differences. Water voles leave their droppings in large ‘latrines’ (piles), close to the water, whereas rats leave theirs in smaller numbers along paths. 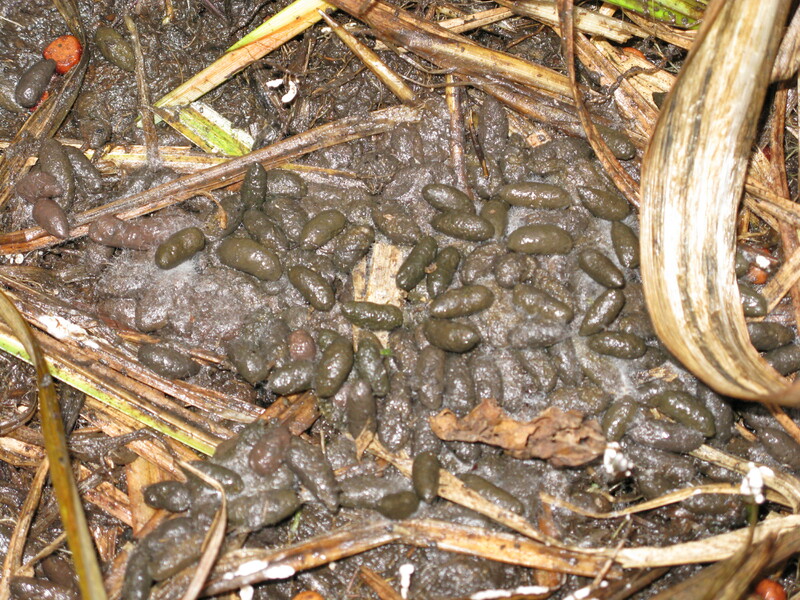 Water vole droppings are smaller than rat droppings and are rounded at both ends; rat droppings are flattened at one end and pointy at the other. Water vole droppings are green, brown or purple, have a putty-like texture and no strong smell. Rat droppings are light brown to black, slimy and soft, and smell unpleasantly like wee. Mice produce very similar droppings to rats, but they are much smaller. Bats leave droppings where they roost, so they can often be found stuck to walls or on the ground under holes or trees. They have a rough appearance and are filled with chewed-up bits of insect. 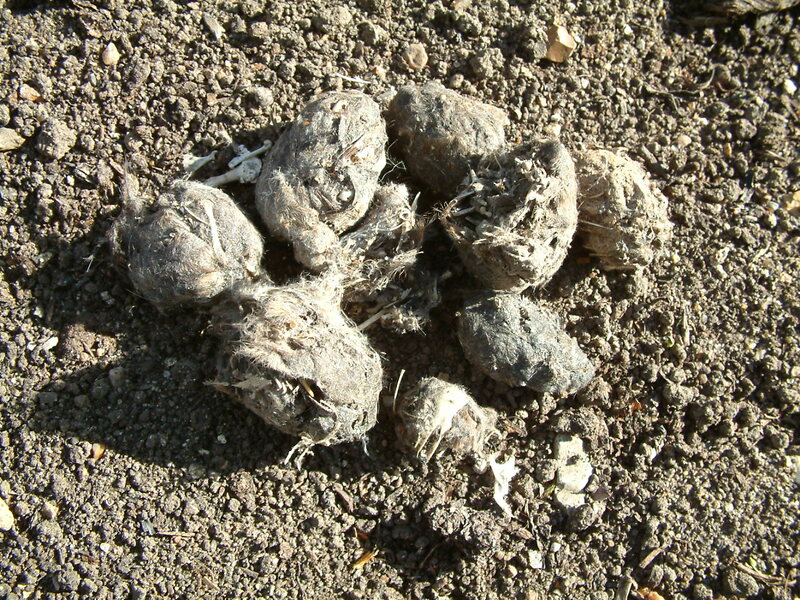 Hedgehog droppings are about 5 cm long, cylindrical and generally quite dark. They might be filled with bits of insects and worms. It looks like poo, but could it be something else? Owls regurgitate parts of their food that they cannot digest, such as the fur and bones of small mammals and birds. 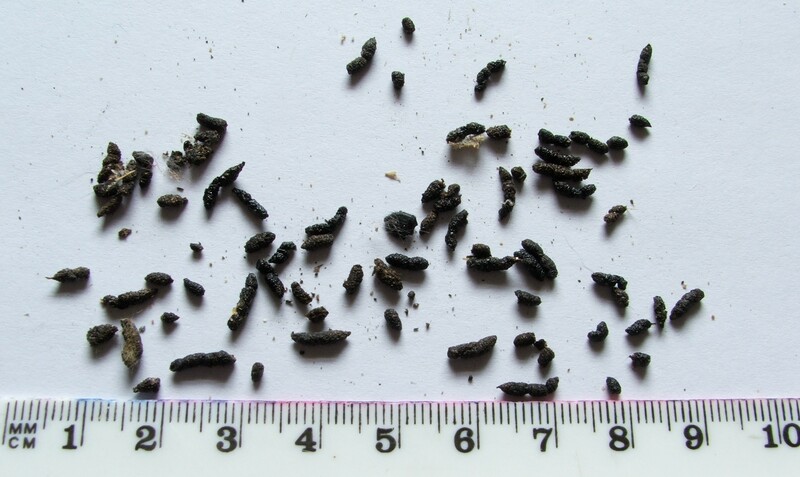 These ‘pellets’ can look like animal droppings, but do not smell and gradually turn grey as they dry out. The Wildlife Trusts manage nature reserves for the benefit of all kinds of mammals. Find out more about the UK's mammals using our species explorer! You can find out more amazing facts about wildlife on your doorstep by becoming a member of your nearest Wildlife Trust!